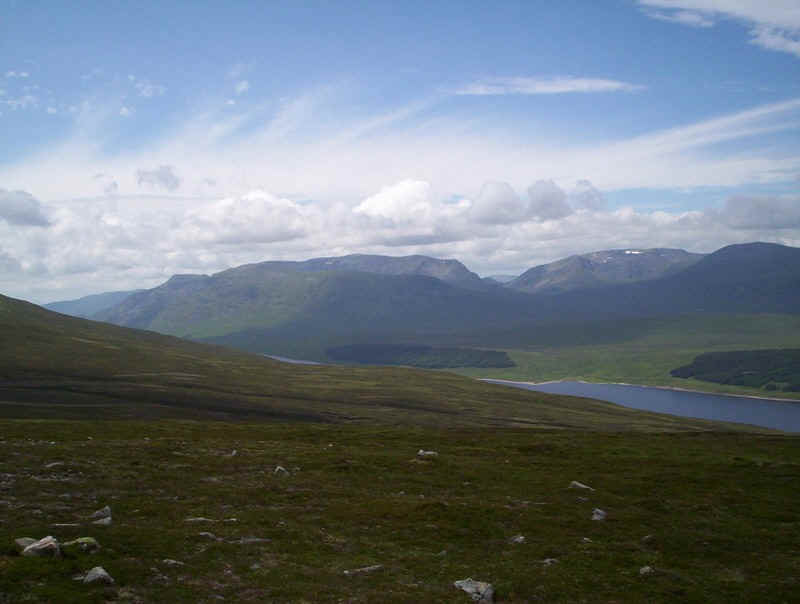 A Saturday in July 2009 saw me catching the first train from Perth up to Dalwhinnie, with the intention of climbing all four Munros on the west side of the Drumochter Pass. 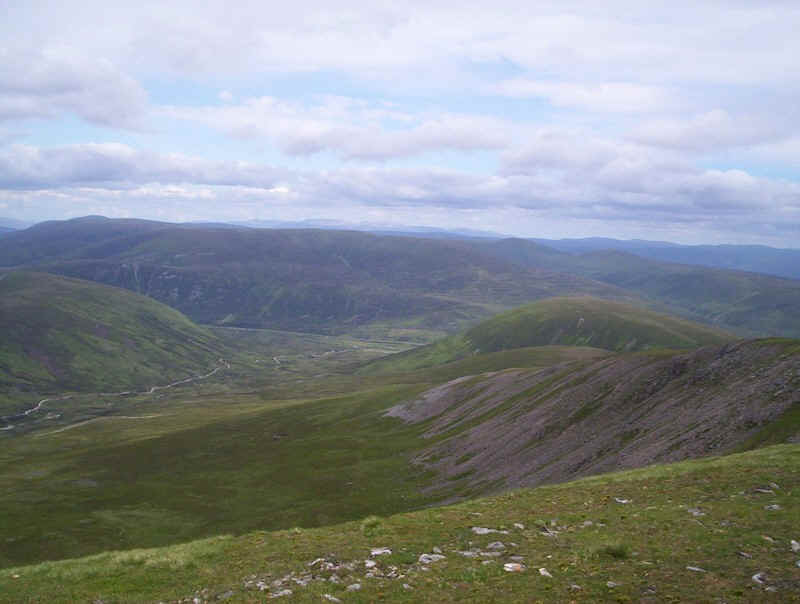 I'd worked out that it was just about possible to climb these hills and arrive back at Dalwhinnie in the early evening for a meal at the Inn at Dalwhinnie, before catching the late evening train back to Perth, where I was staying. My route plan showed at start at 09.20 with a finish at 19.30, allowing time for a meal before the train at just before 21.30. It looked very tight, but possible, provided I didn't waste time or have long breaks. 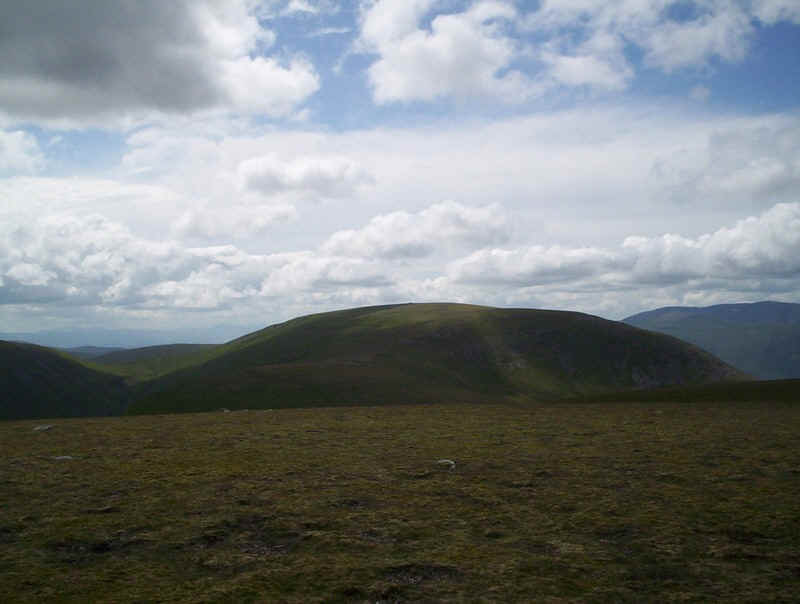 I wanted to avoid walking along the A9 unless absolutely necessary and initially decided to walk back over two of the summits. However, I also did route timings for dropping down to Balsporran cottage and then using the cycle path. The total return distance is about 38km (24 miles). 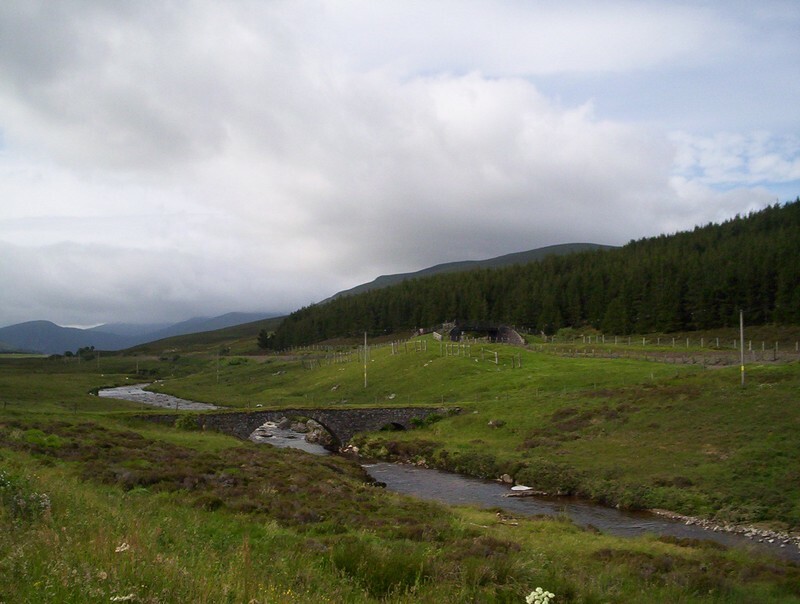 The start of the walk proper begins at Wade Bridge, near where the old A9 through Dalwhinnie village joins the new A9. 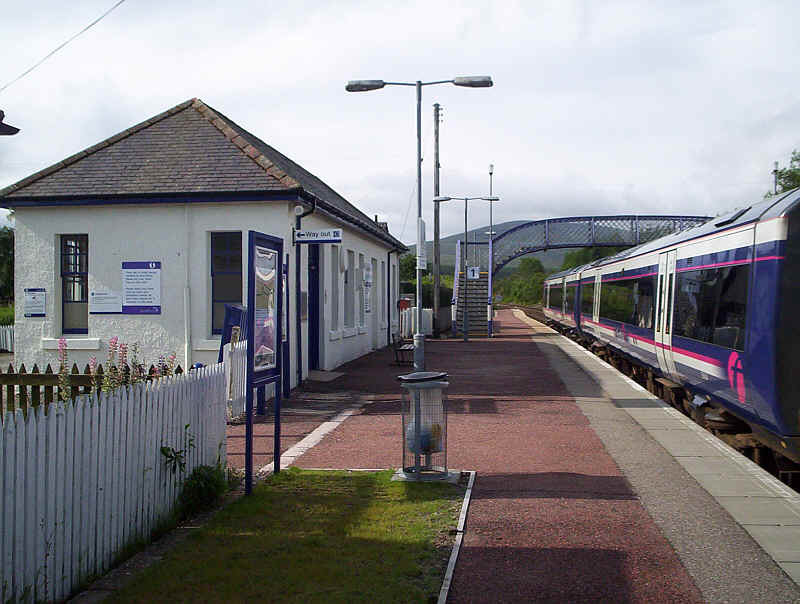 There's a gate at the footbridge over the railway line which has to be climbed. Beyond the bridge turn left to the edge of the forest. 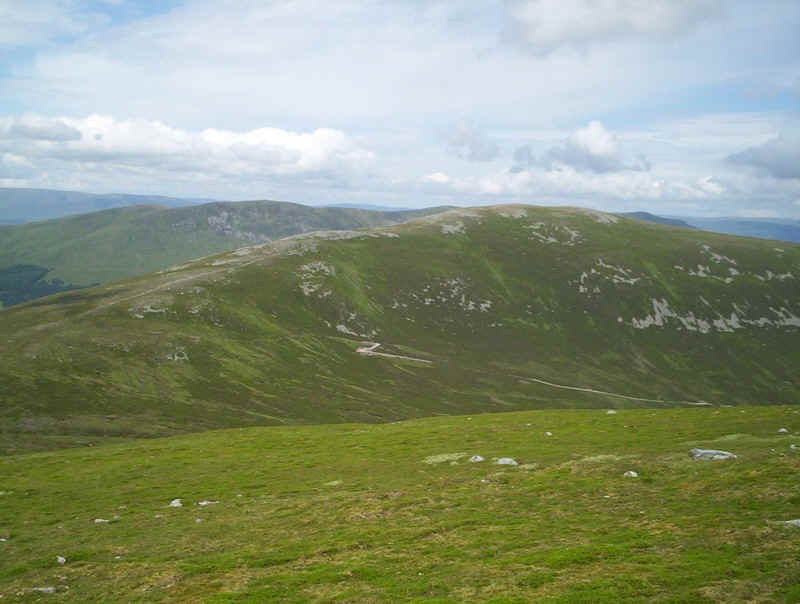 From the forest edge I set a course for the first summit of Meall a'Bhurich. 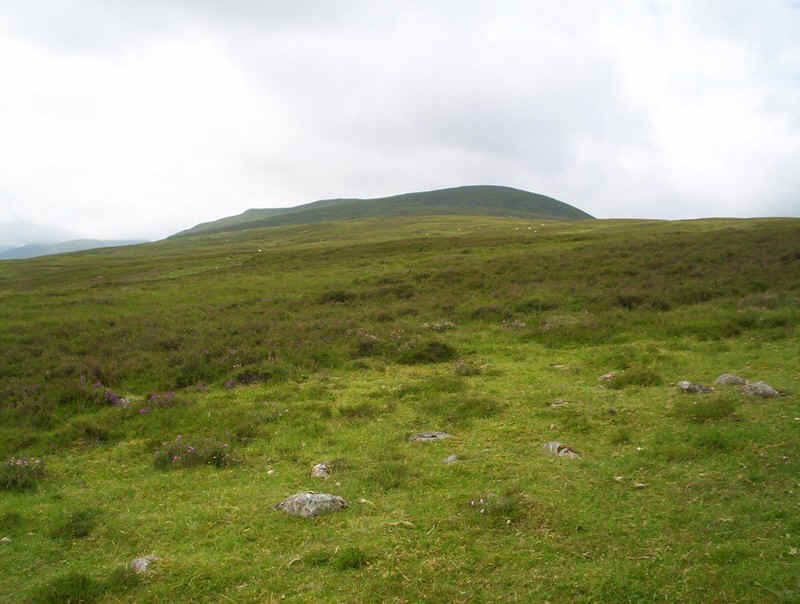 Until you climb to the crest of the ridge there's a lot of heather to cross before reaching grass. 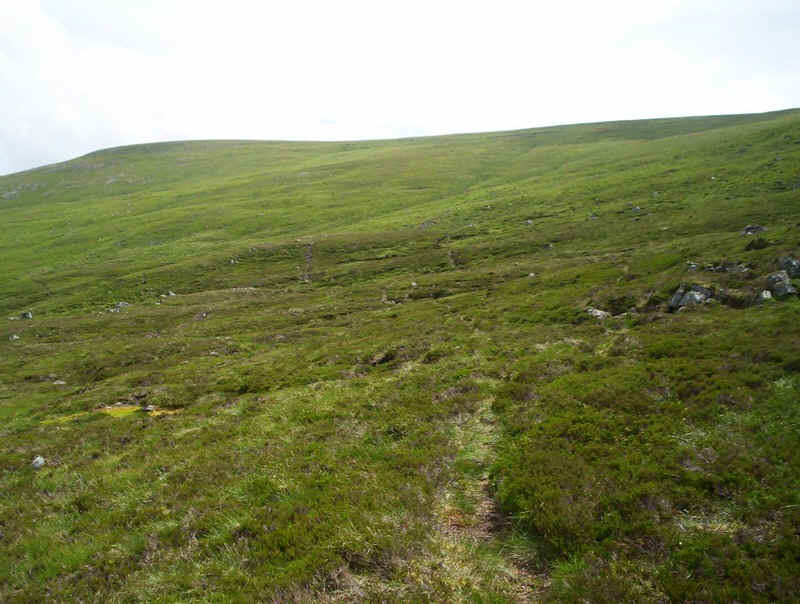 It would probably have been easier to walk up by the side of the forest and then turn south west on to the grassy ridge at the end of the plantation at about NN630825. 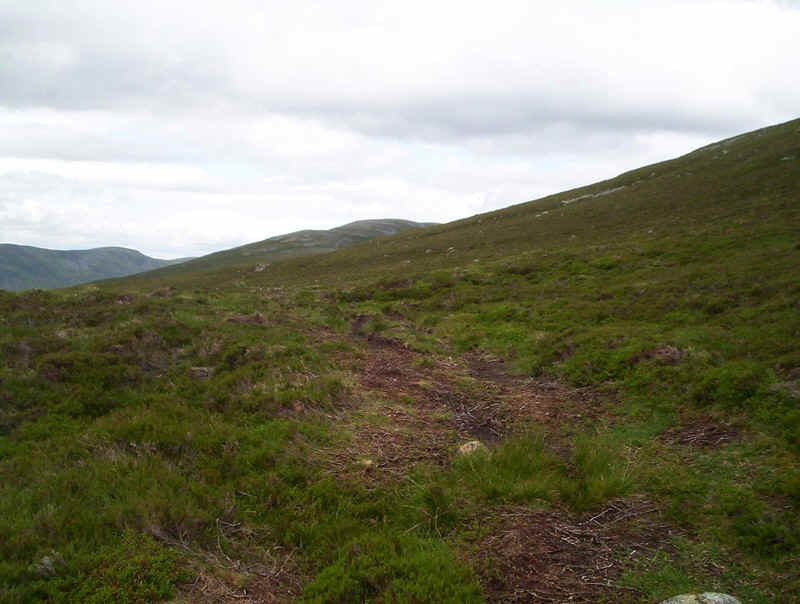 Having ploughed through the heather a track appears which continues most of the way uphill. 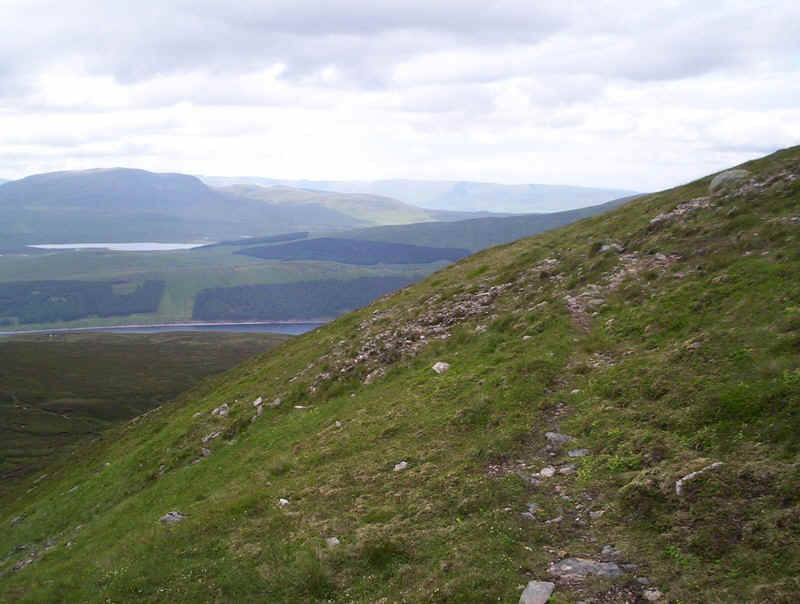 Looking back down towards the forest with Loch Ericht to the left. 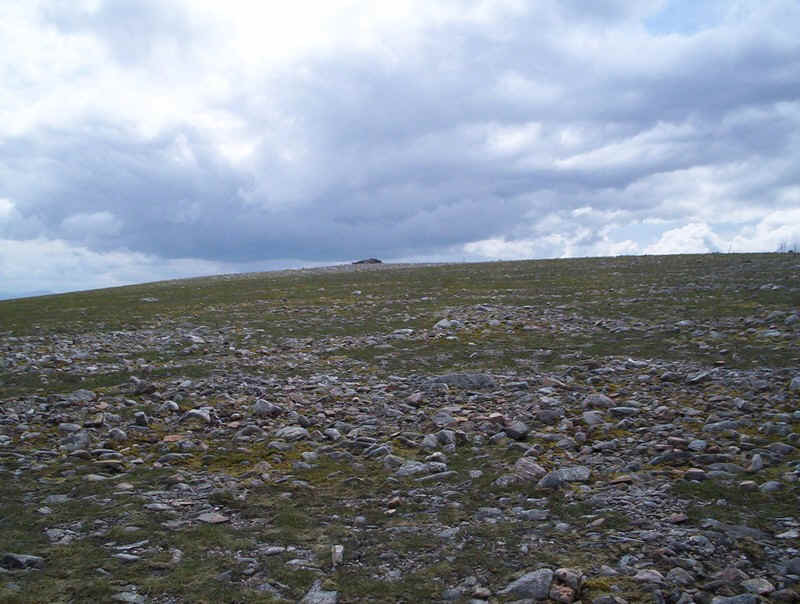 Creagan Mor, at 772m, has this small cairn. 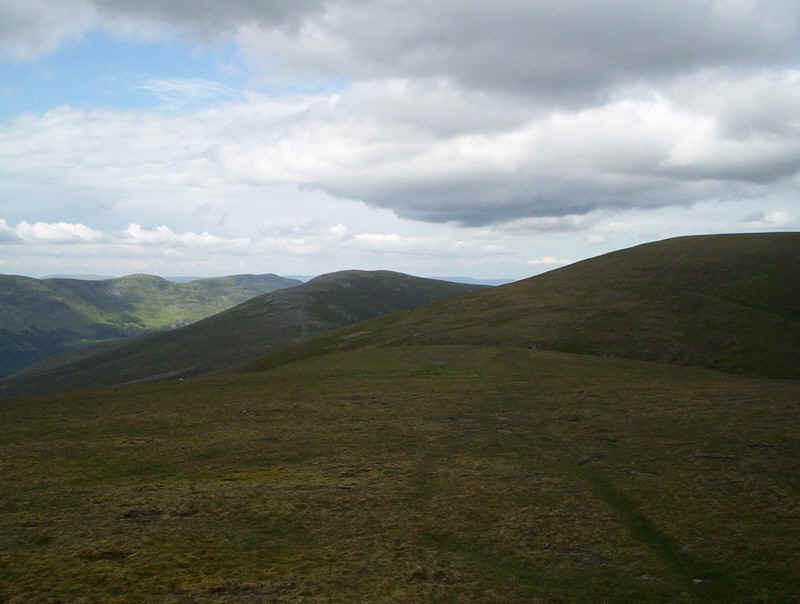 There's now a steady climb towards Geal Charn - a feature of this walk is the intermittent nature of the paths and tracks. 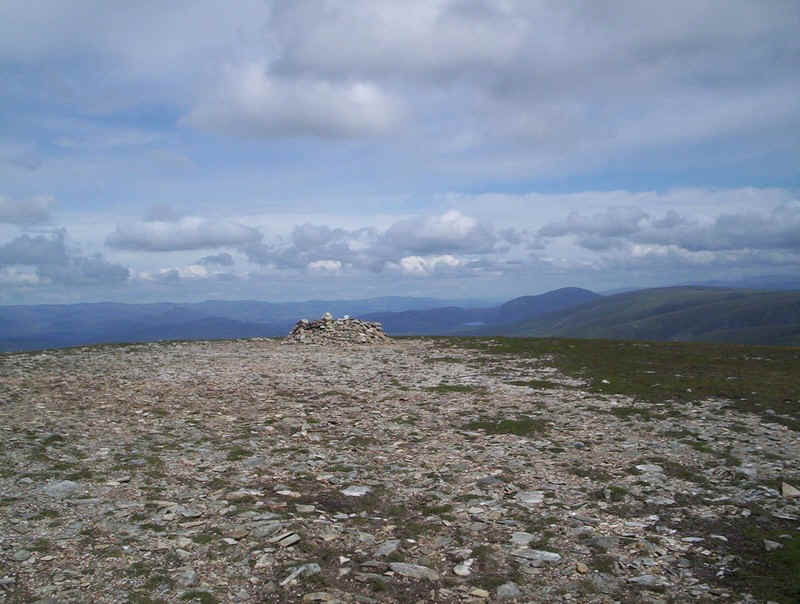 Geal-charn was reached half an hour later than I planned. It was a warm day and the climb through the heather had been harder than expected. I'd also had to stop to put plasters on the backs of my fet - the heat seems to be causing me problems this year with blisters forming quickly during the initial climb. So it was a very quick ten minute lunch break as I began to reconcile myself to the likliehood that I won't manage to climb all four hills today. 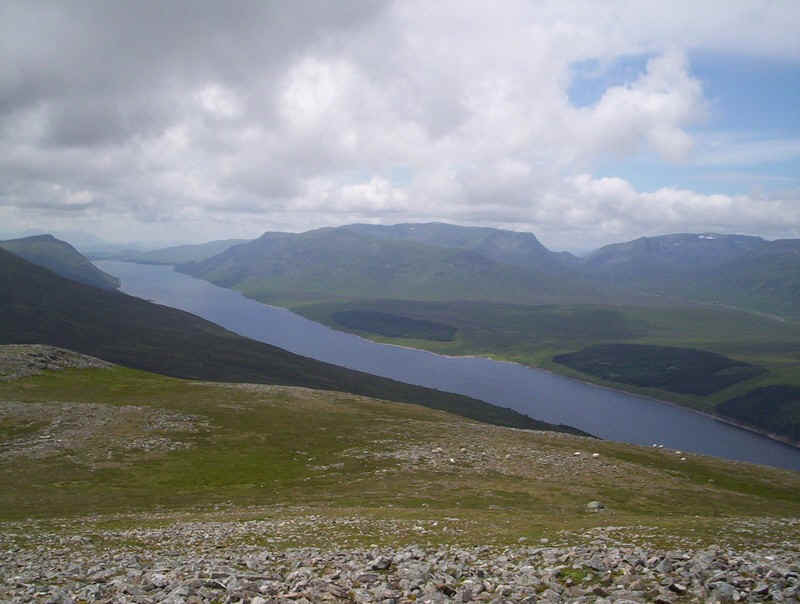 Looking down Loch Ericht with Ben Alder and Geal Charn to the right. There's still a lot of snow left. 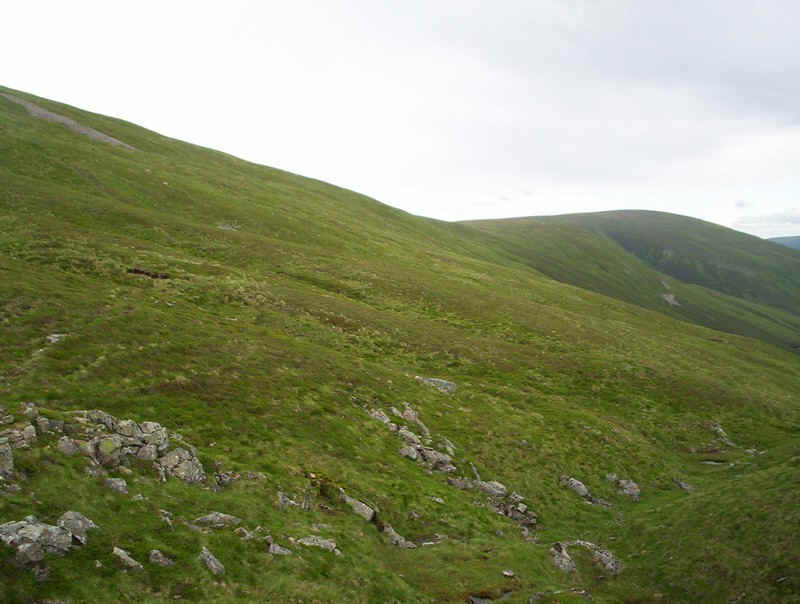 ..... with the next target A' Mharconaich looming above. 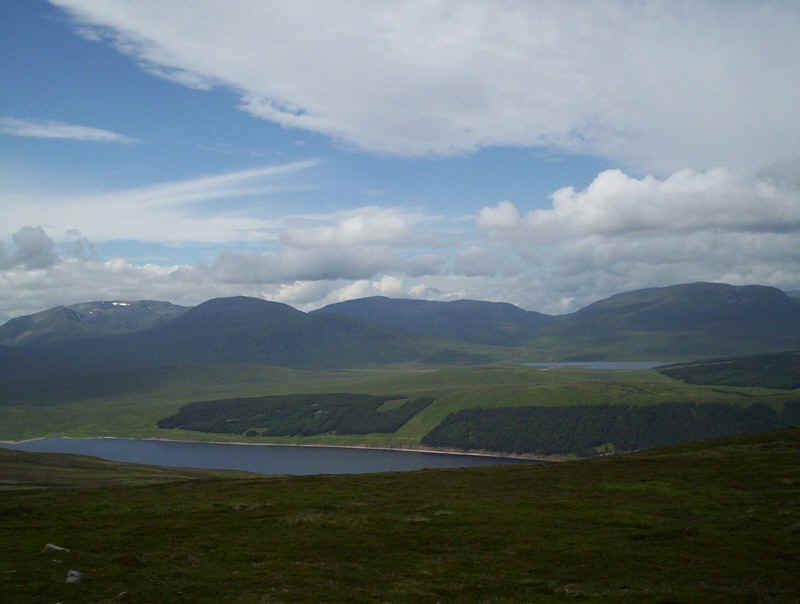 ..... and some of the "lesser" hills and Loch Pattack. 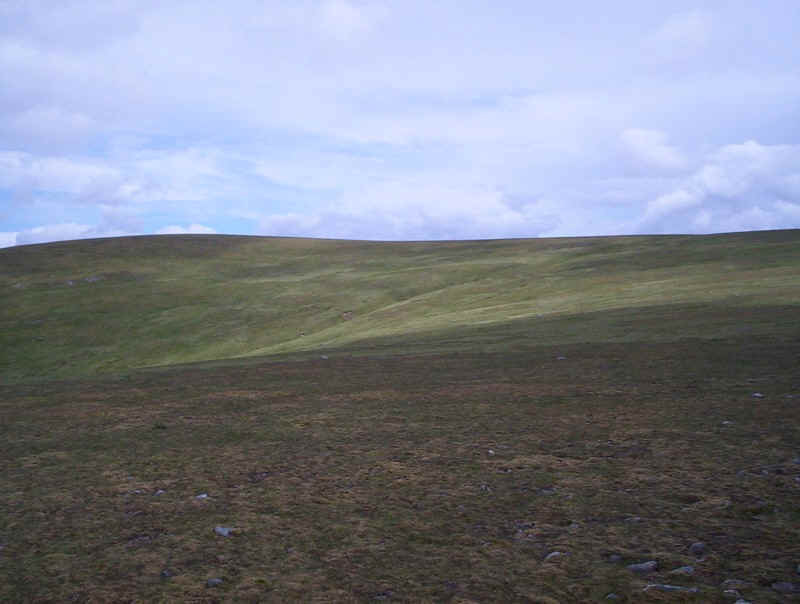 Here I'm looking back uphill towards Geal Cham. 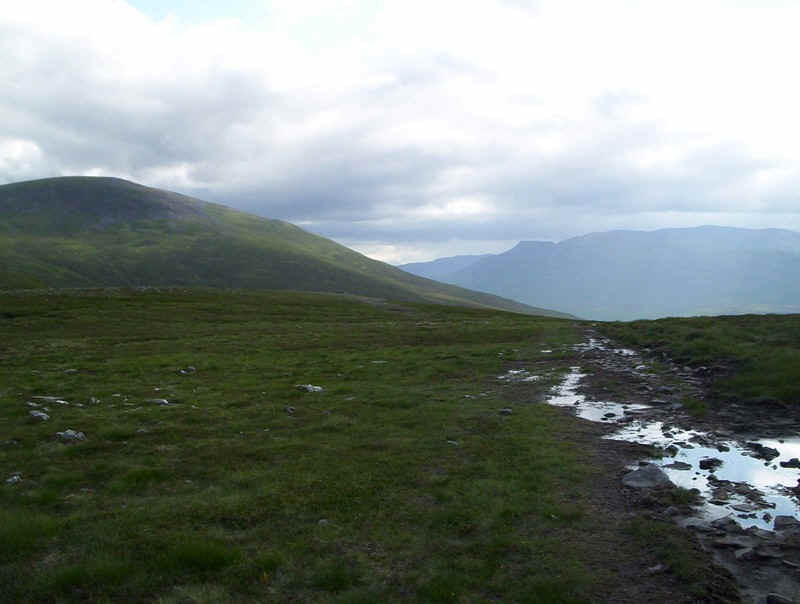 At the bealach the path up to A' Mharconaich leaves the broad track that's come up from Balsporran cottage and heads promisingly towards the summit. Needless to say, it soon disappears so it's simply a case of plodding uphill towards the summit. 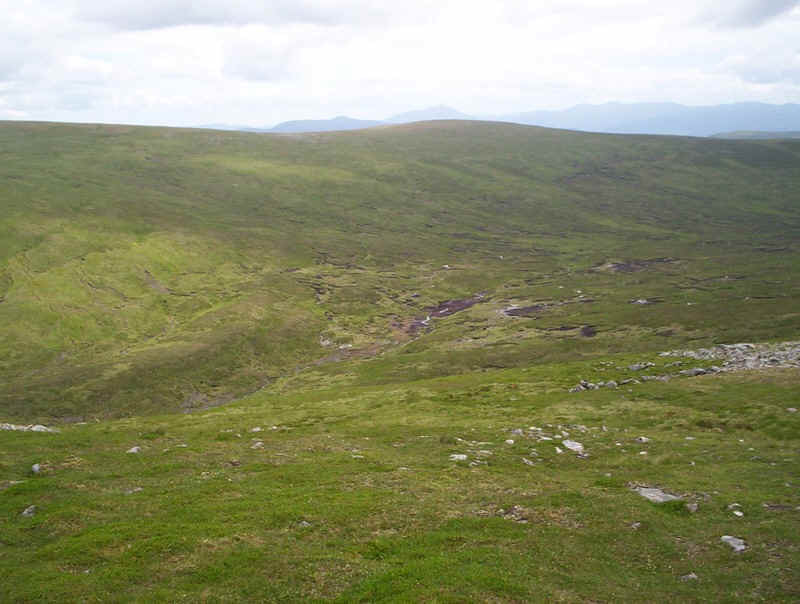 Geal Cham seen from the climb to A' Mharconaich. 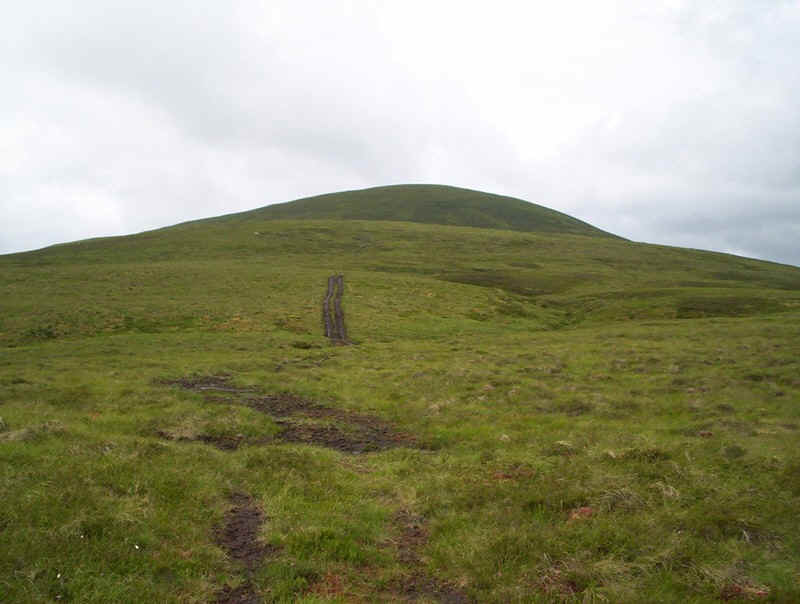 The landrover track down to Balsporran cottage can be seen clearly. 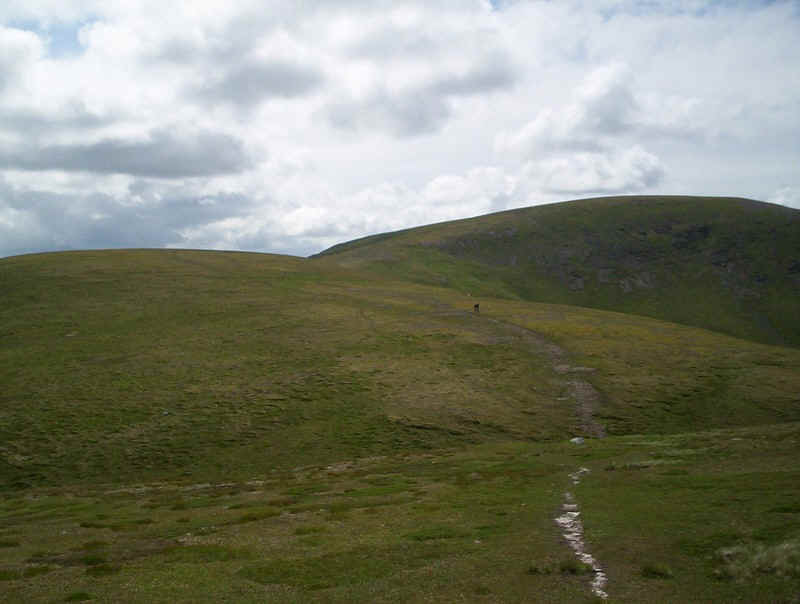 Onwards and upwards, but my GPS gives an estimated arrival time almost at the time I'd hoped for; perhaps I will be able to do all four hills after all. 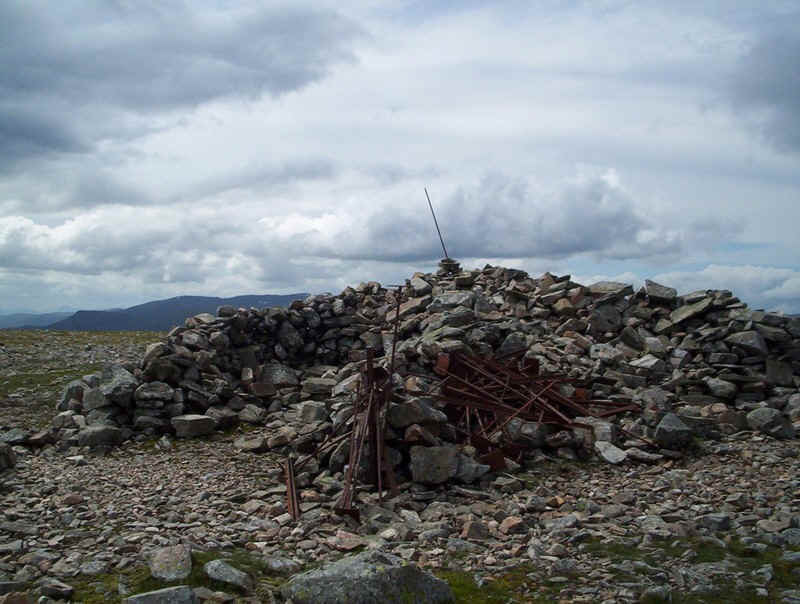 The windbreak cairn on the summit of A' Mharconaich was reached just ten minutes late. 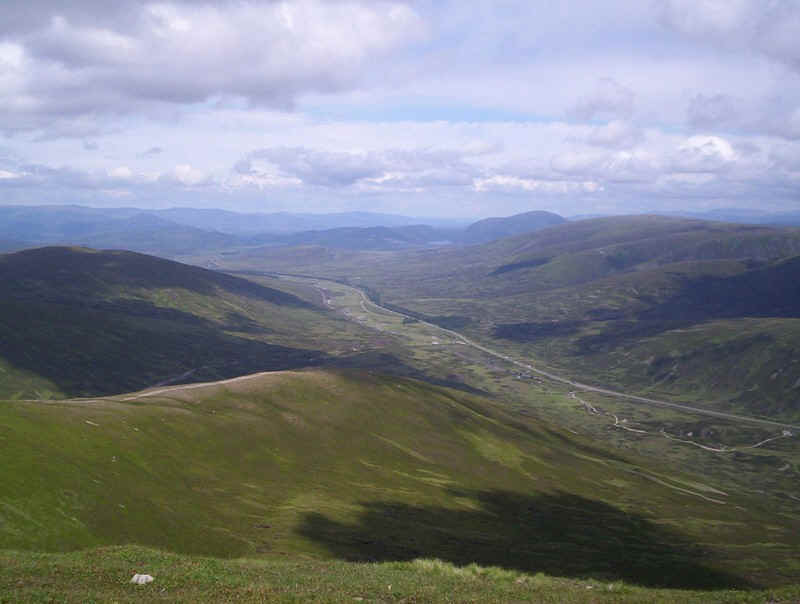 All day the views were all that could be wished for; looking north east towards the Cairngorms. ....to reach the low point at 861m. 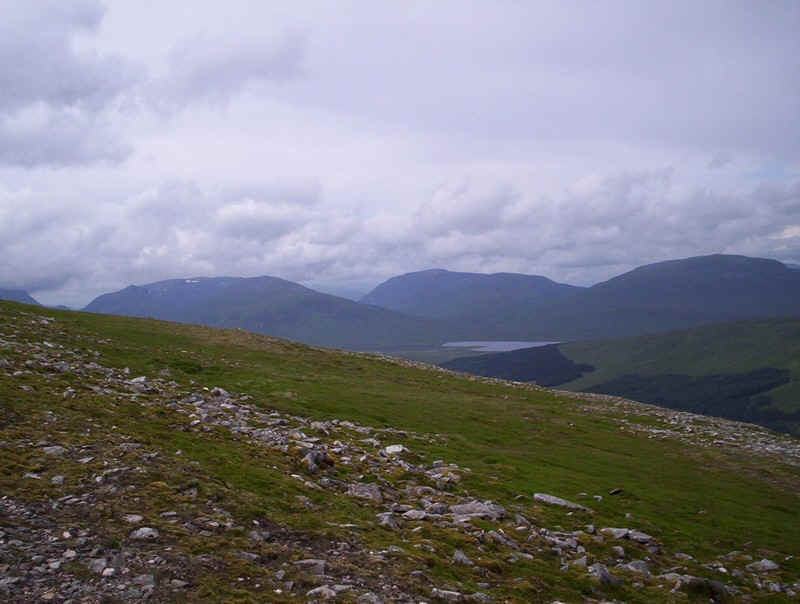 Across the coirie is Sgairneach Mhor, the final Munro of the day - I'd still not decided whether I'd have time to climb it and get back to Dalwhinnie for a meal. 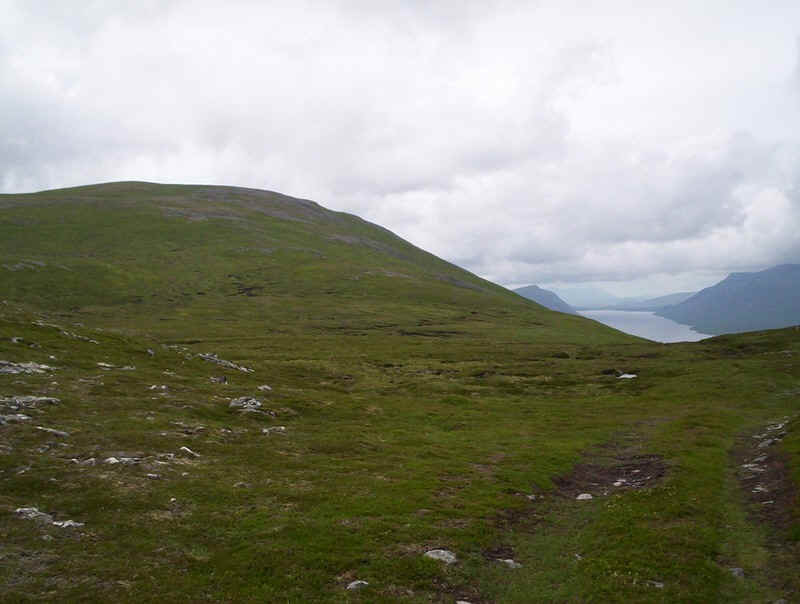 From this low point a clear path leads up towards Beinn Udlamain, although the summit can't be seen yet. ... gives way to a more stony section. 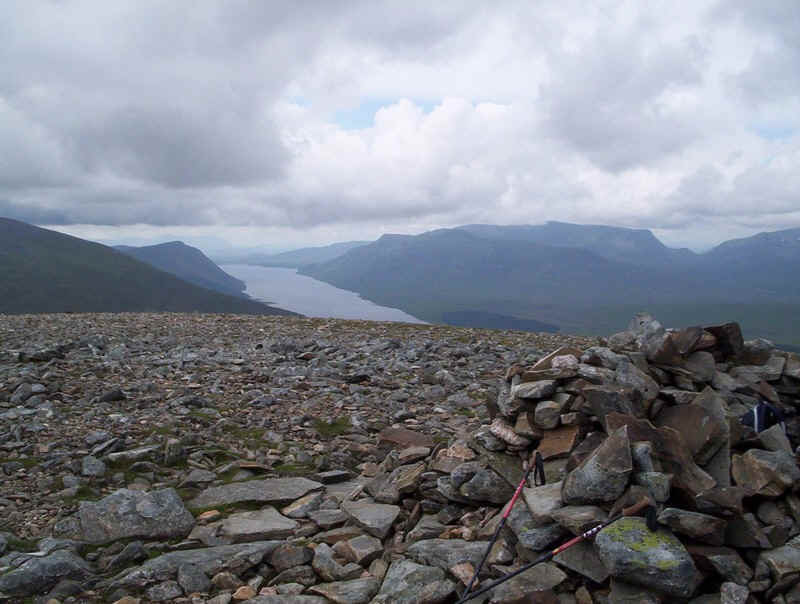 It's time the scrap merchants came and removed this hideous collection of old fence posts from the summit cairn of Beinn Udlamain. 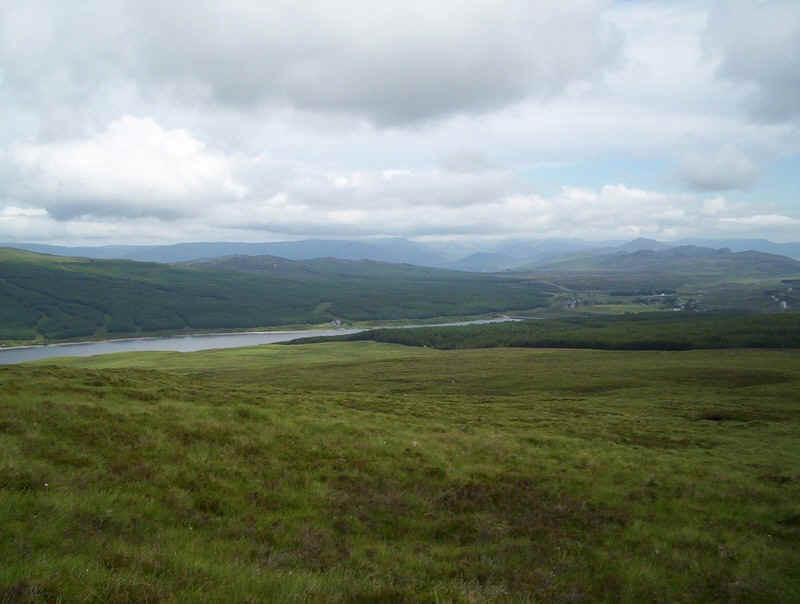 By now I was back on schedule, so decided that I could complete the walk, especially since I'd spotted a possible short cut which would avoid having to re-ascend A'Maharconaich. 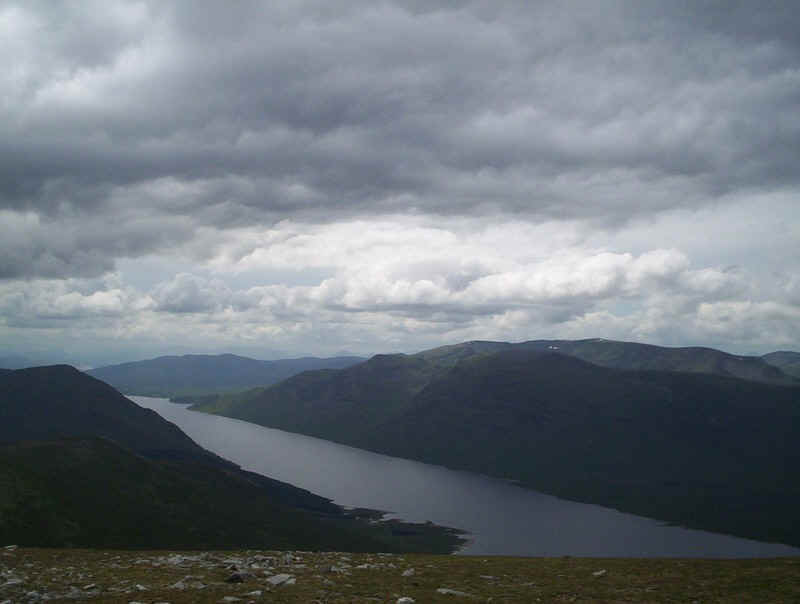 The day wasn't quite as pleasant now and it looked as though the threatened thunderstorms might appear. 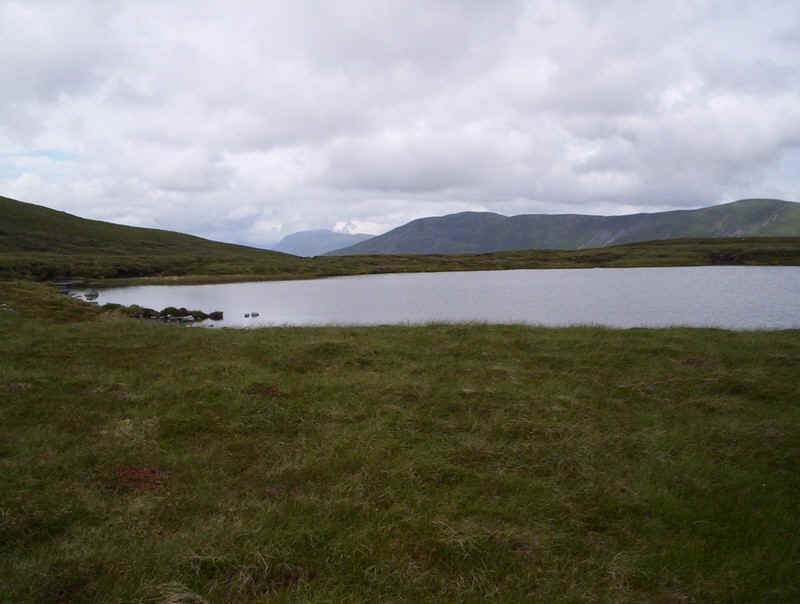 Another view of Loch Ericht look towards Rannoch. 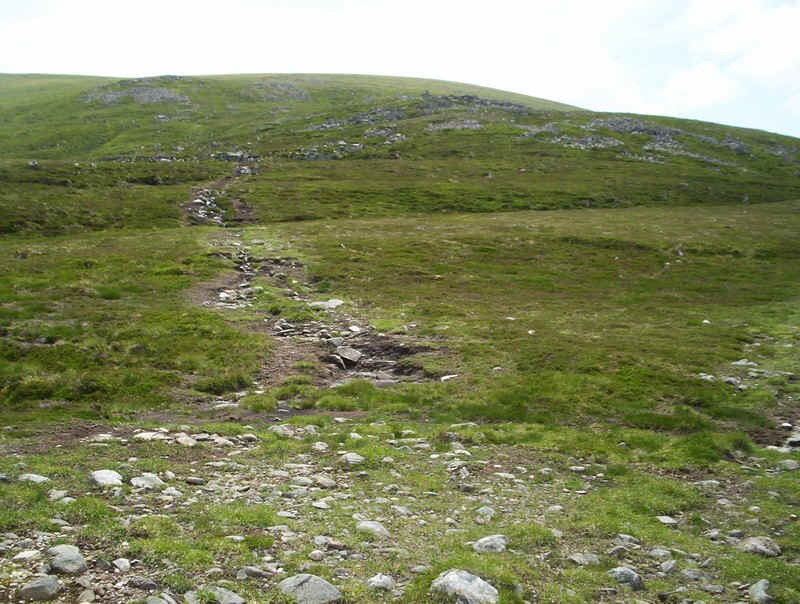 The descent to to the Allt Coire Dhomhain was stony and quite steep. 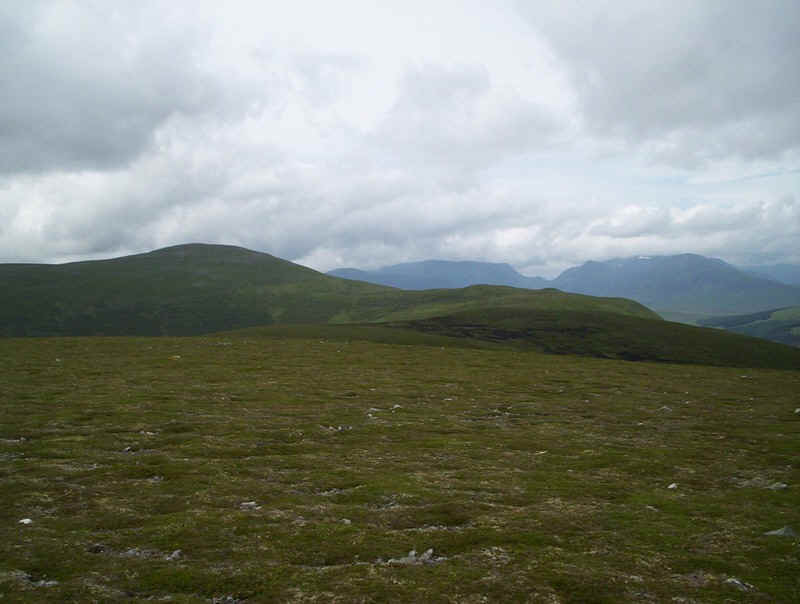 I wondered whether I'd be able to avoid re-climbing Beinn Udlamain by walking along its eastern flanks on my return. 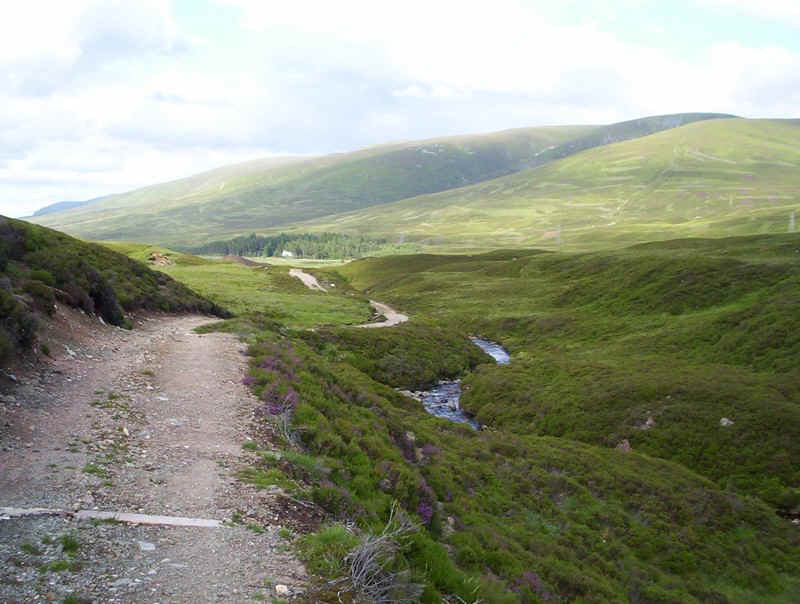 ......and heading up the slopes of Sgairneach Mhor. 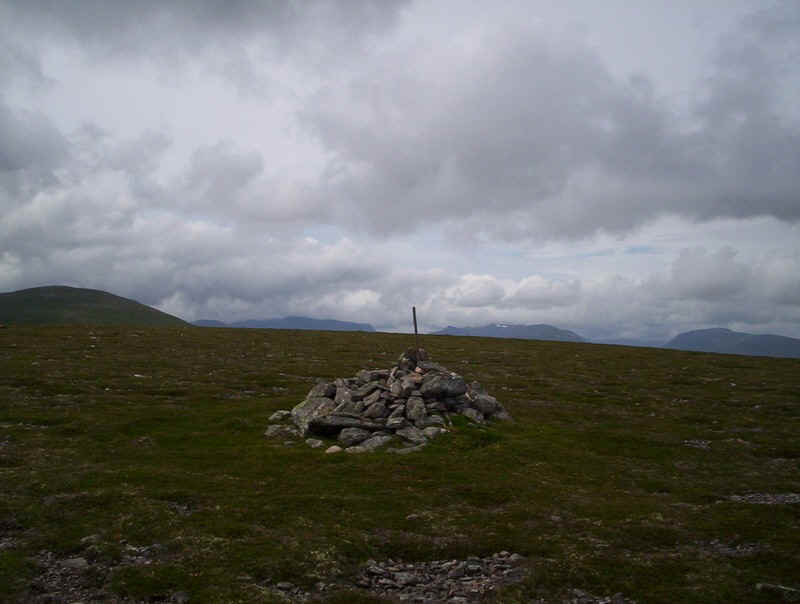 Initially there's a clear path but once it reaches this cairn, with the summit almost in view about two kilometres away, it disappears. 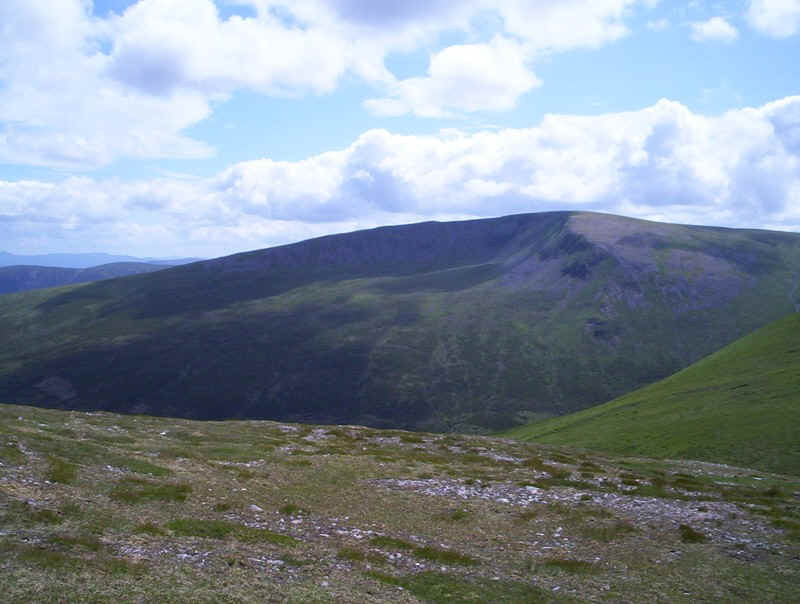 It's now simply a matter of heading for the ridge and then turning east to the summit. 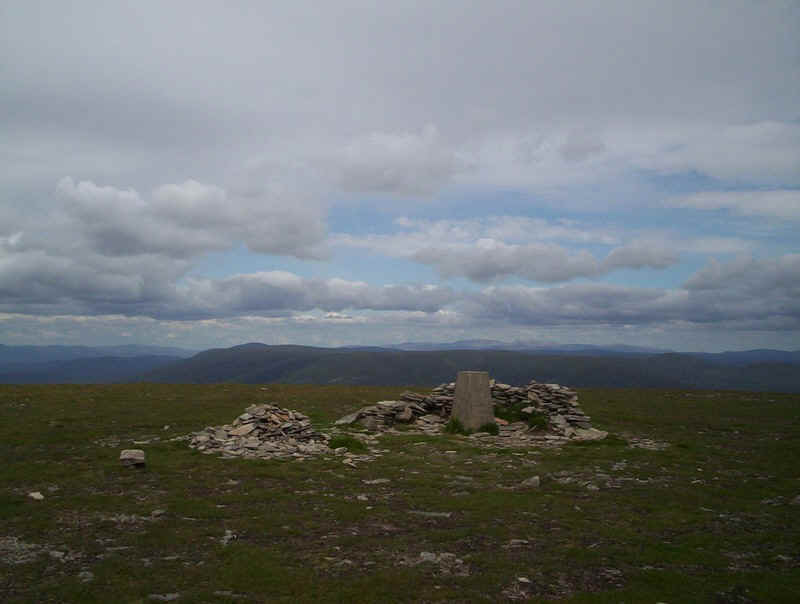 The trig point on Sgairneach Mhor was reached a quarter of an hour early, so I allowed myself the luxury of a break before the return trek to Dalwhinnie - four hours to go; could I do it? 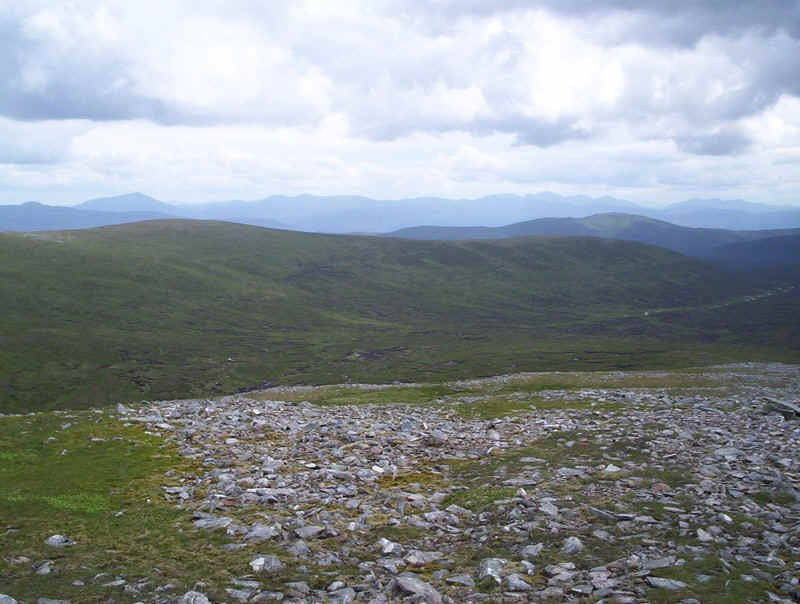 The view from the summit looking towards The Sow of Atholl in the middle right of the photo. I was tempted to climb this Corbett as well, but the thought of the long walk up the A9's cycle track for about three hours did not appeal! 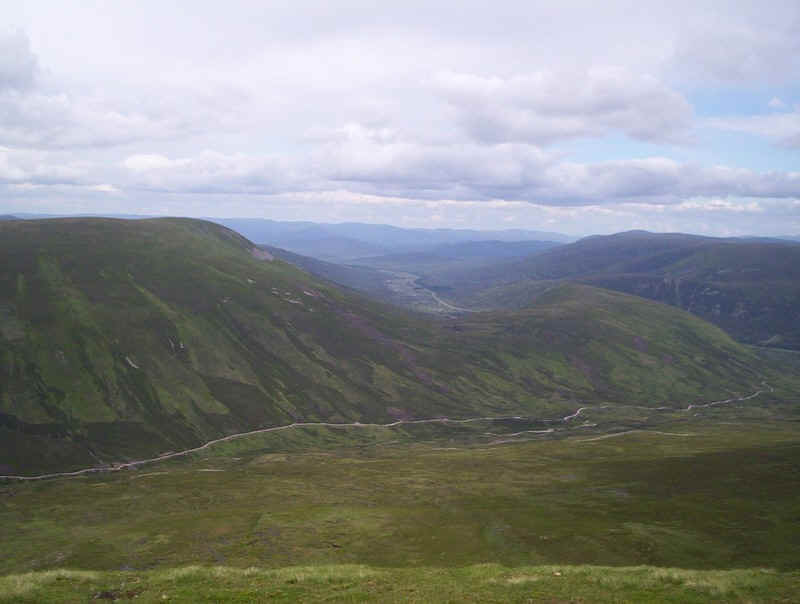 The photo shows the view looking down into Coire Dhomhain from the slopes ofSgairneach Mhor; this vehicle track is one possible return route to the A9 cycle track. 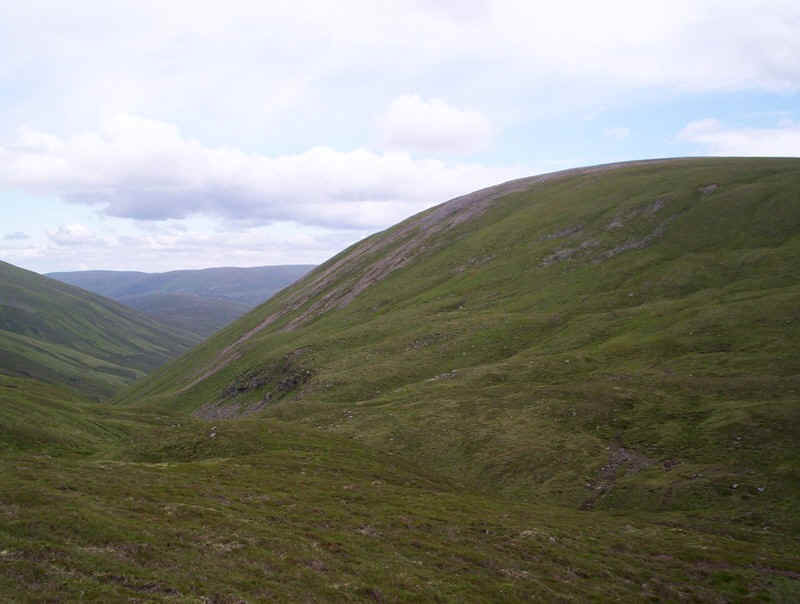 I returned to the Allt Coire Dhomhain where I'd noted a path which appeared to run along the eastern flanks of Beinn Udlamain. The start was at NN58160 73050. This looked promising as it headed off northwards. 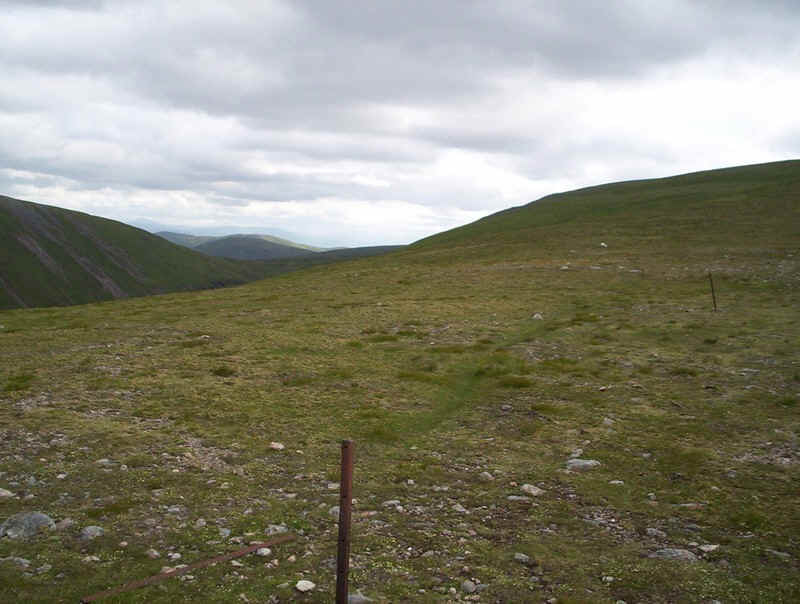 I set the GPS to point to the spot height at 902m, which is on the line of old fence posts between A' Mharconaich and Beinn Udlamain. 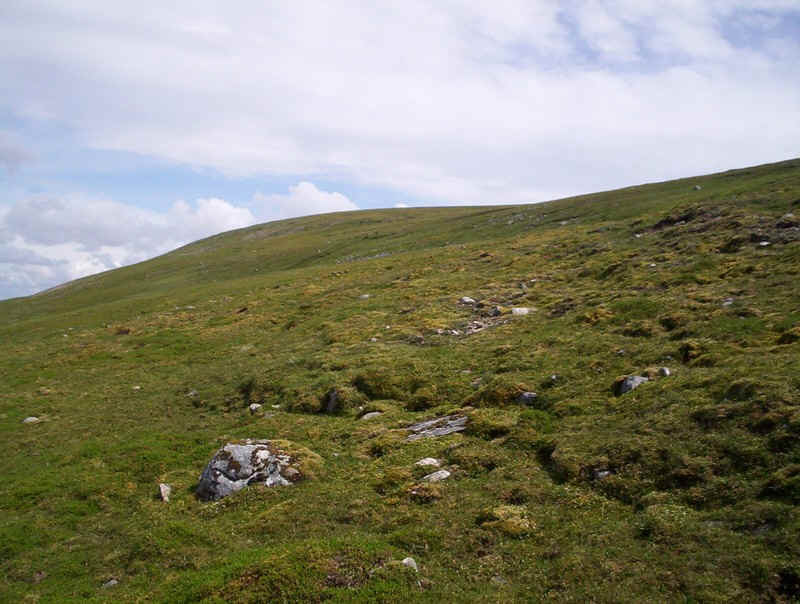 After a few hundred yards the track petered out (once again) but the slope was relatively gentle and it was easy enough to walk at round about the 900m contour line. I disturbed a small herd of red deer which scattered as I approached them. 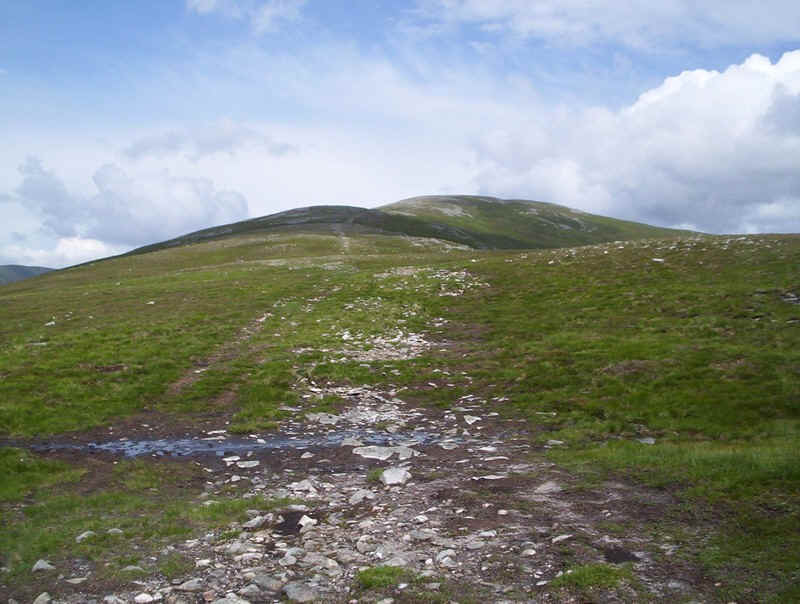 There were one or two streams to cross; one with a bit of a drop down into the gully but it was certainly a lot easier than climbing up the 200m to the summit of Beinn Udlamain. .....to join the main path. 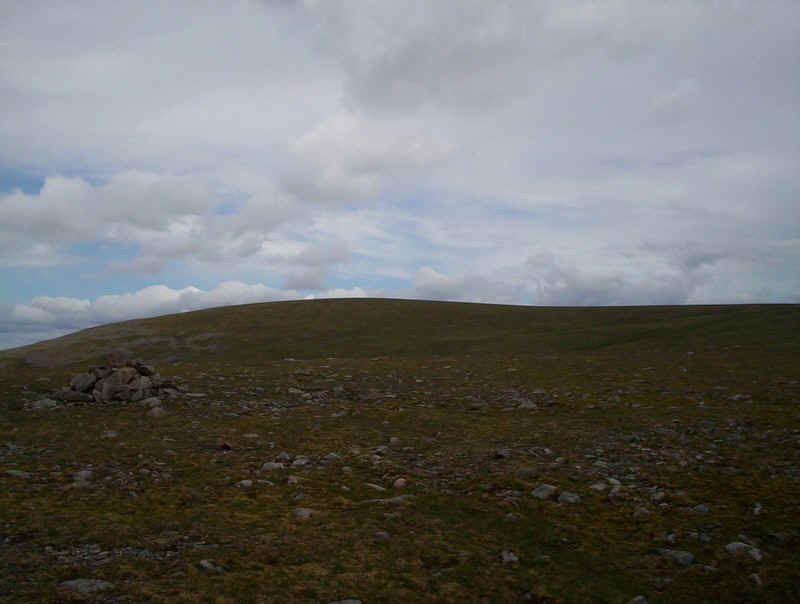 My timings showed that I reached this spot at about the same time that I'd have reached the summit so I'd obviously saved a bit of time. Things were looking good! 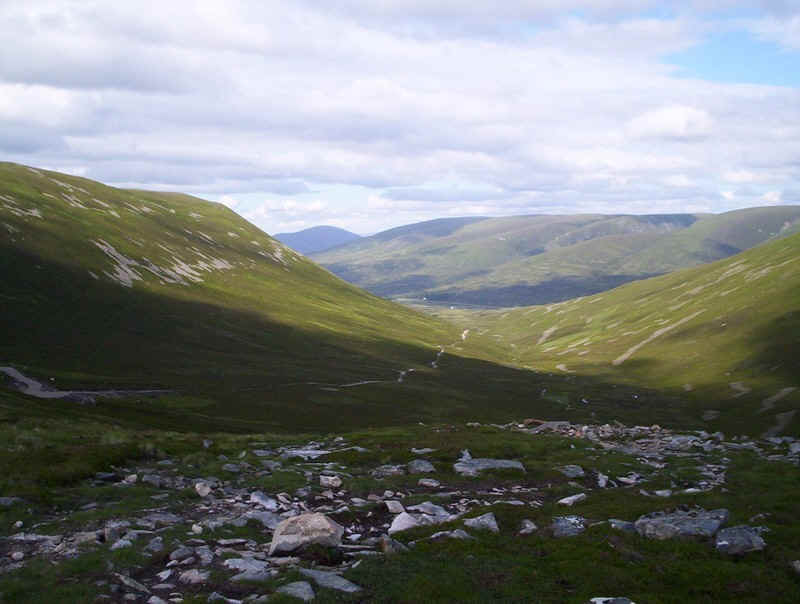 I mentioned earlier that I'd spotted a possible cut-off route down to the bealach at the head of Coire Fhar and the path to Balsporran. 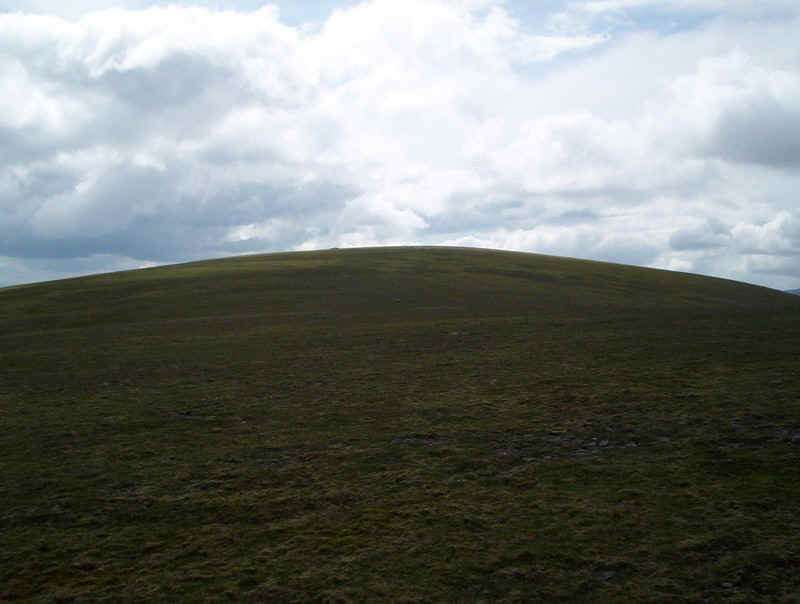 This avoids a re-ascent of about 100m. 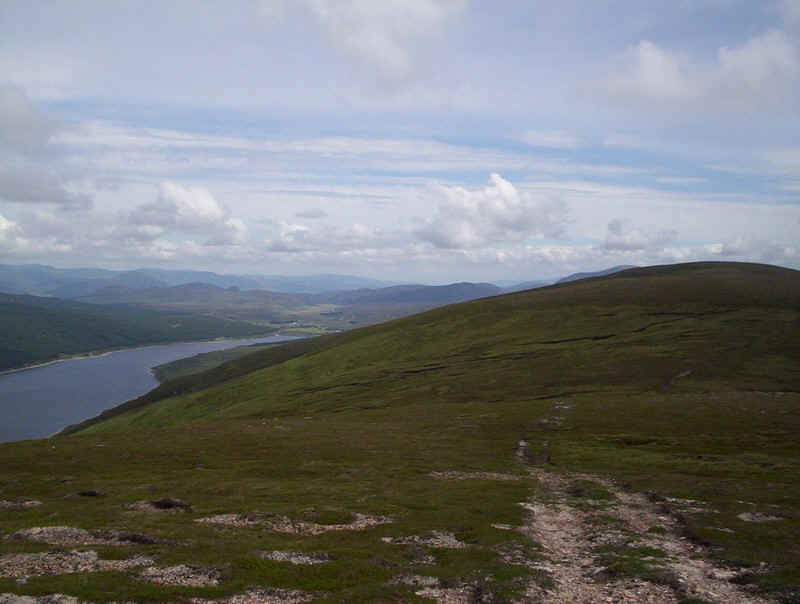 ..... a path heads across the western flanks of a'Mharconaich. 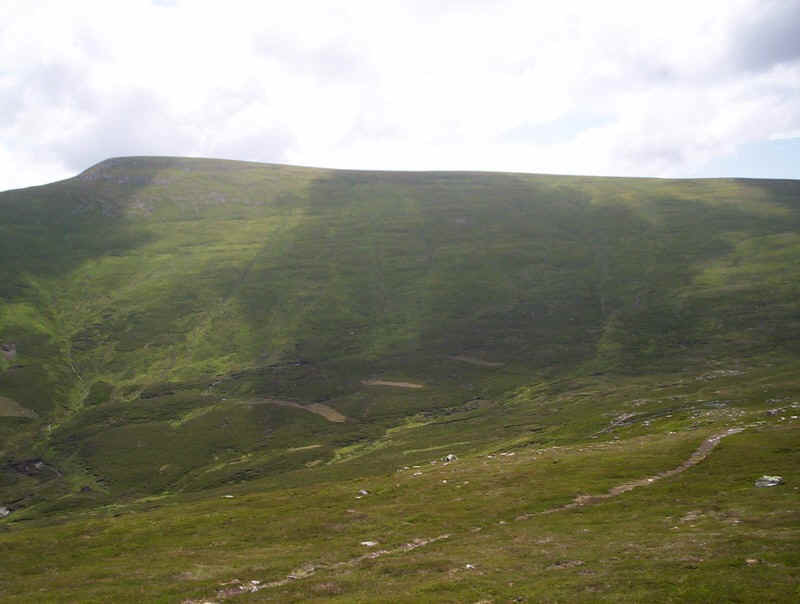 At first it's clear but, as the slope steepens, it disappears. 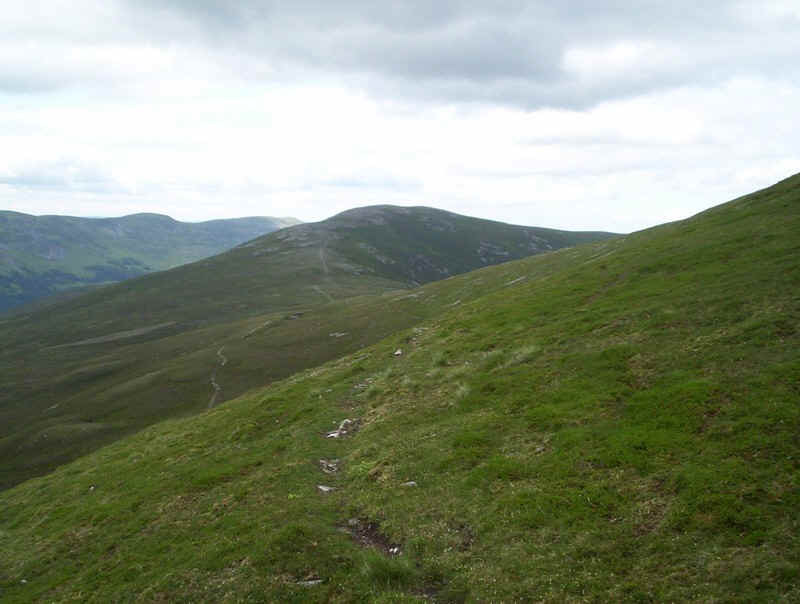 Eventually the slope became too steep to walk along comfortably so I descended to the track that comes out of Fraoch-choire, which can be seen to the left in this photo. 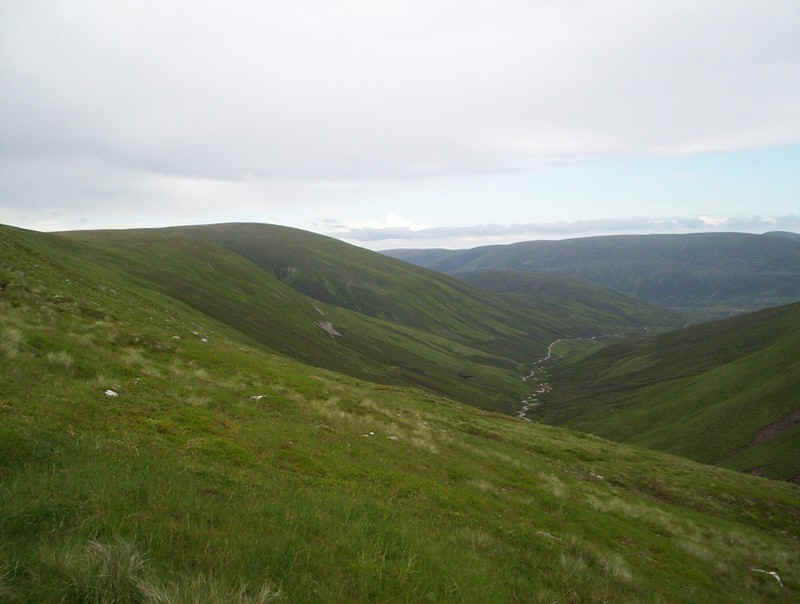 Then there's only a very slightly rise to the bealach at the head of the Allt Coire Fhar. 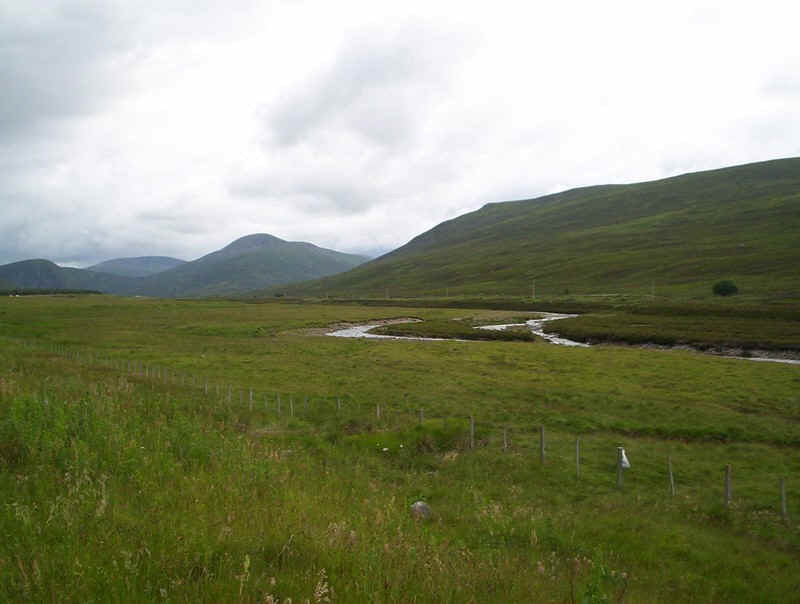 By now I was nearly half an hour in advance of my estimated time, so I headed off down to Balsporan cottage confident of reaching Dalwhinnie by 19.30! There's a good landrover track down the valley. A last few minutes of peace before the hell that is the A9. 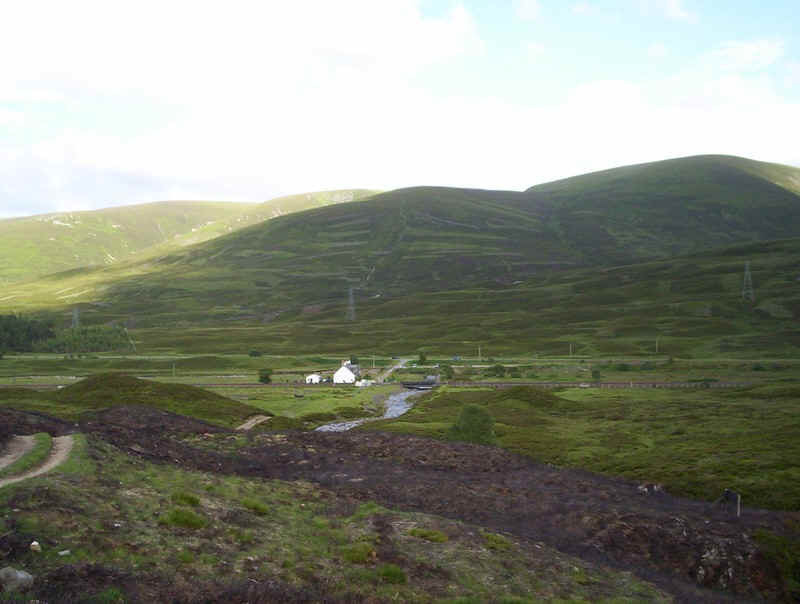 Balsporran cottage appears. There's a telephone to speak to the signalman if needed before crossing; probably advisable if it's misty. You'll hear the rails "singing" if there's train approaching. 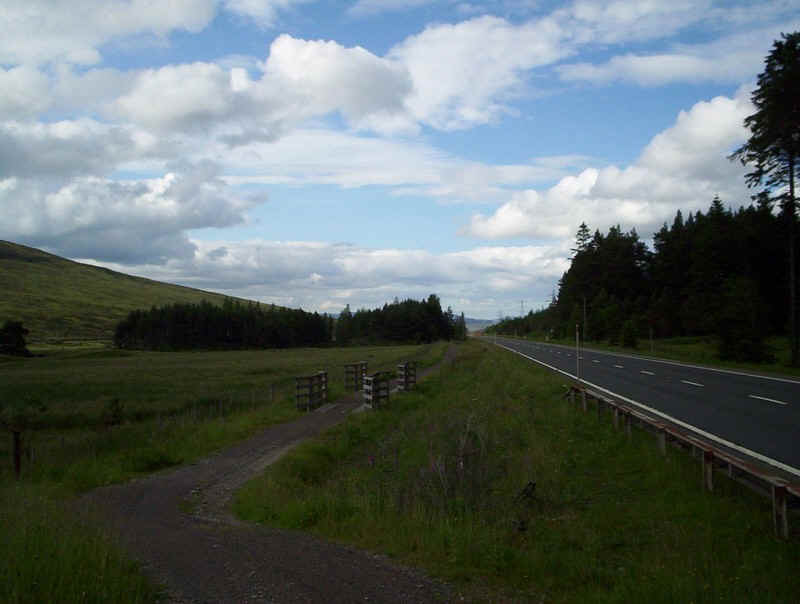 The cycle path is largely separated from the main road and, in places, is actually on the old A9 itself. It would appear to be perfectly safe for walkers; no cyclist appeared either. 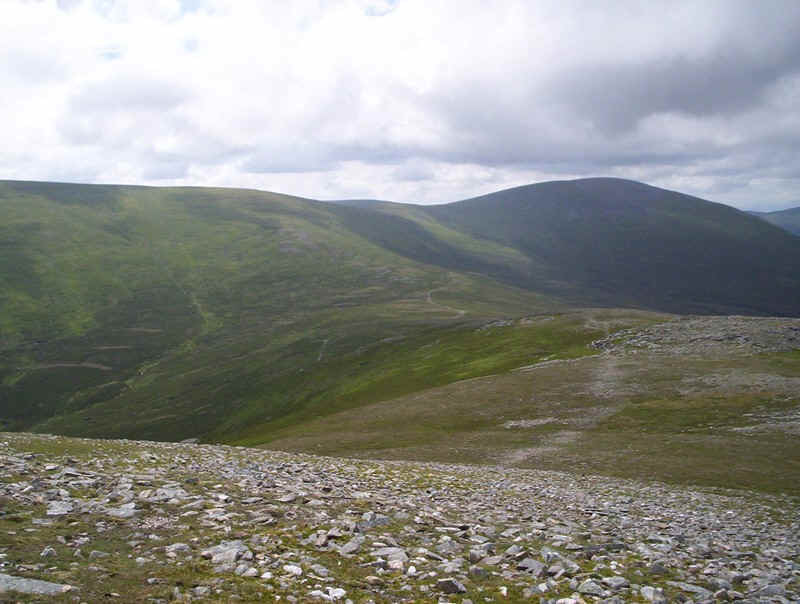 Looking back towards Drumochter summit. Oh! by the way, the food at the Inn at Dalwhinnie was excellent although it's a curious cross between a restaurant and a self service cafe. Recomended! It was an interesting experience walking to a very tight schedule. I've never done this before and, without doubt, my trusty GPS proved its worth once again. By giving me advanced warning (and sometimes encouragement) about the estimated time of arrival at each point in the walk I was able to adjust my pace accordingly. I don't normally like a walk to be as pressured as this, but I still thoroughly enjoyed the experience. Of course, another plus point was using public transport and completing the entire walk under my own "steam". And talking of steam; the day was enlivened by the appearance of a steam hauled special train both in the morning and in the evening. Click on the link below.